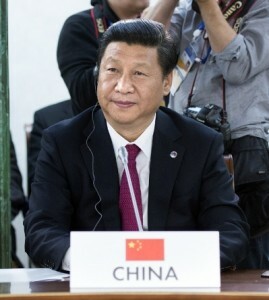 Chinese President Xi Jinping says the BRICS group should step up cooperation on major global issues. “BRICS members should expand consensus on major international issues and enhance solidarity and cooperation,” said President Xi. “BRICS members should join hands to maintain and promote the openness of the world economy, oppose trade protectionism, safeguard the multilateral trade system, and advance the Doha Round of trade talks”, said the Chinese leader. The five countries, Xi suggested, should also work together to obtain a bigger say for developing countries in global economic governance and push forward the quota reforms of the International Monetary Fund. The BRICS leaders had met ahead of the opening session of the G20 Leaders’ Summit in Saint Petersburg. “Under current circumstances”, the Chinese president said, “BRICS nations should jointly tackle the spill-over effect of the developed economies’ loose monetary policy”. He was echoed by Indian Prime Minister Manmohan Singh who had raised concerns about the recent speculations about the US Federal Reserve’s plans to end a $85 billion a month stimulus programme that has prompted a massive capital flight in emerging economies. “There is a note of caution I would like to insert from the perspective of developing countries. Regulations aimed at increasing the stability of the financial system should not operate to the disadvantage of developing countries. If we cannot moderate the volatility of total capital flows let us at least avoid amplifying this volatility through the banking system,” Singh said in his address to the G20 members on Thursday. The Chinese president also urged developed nations to carry out effective structural reforms, and seriously consider the timing, steps and patterns of withdrawing their quantitative easing measures. China has confidence in the emerging market economies, Xi said. Earlier on Thursday, BRICS announced progress on the BRICS Bank to be called the New Development Bank (NDB) and a $100 billion contingency reserve arrangement (CRA). “On the NDB, progress has been made in negotiating its capital structure, membership, shareholding and governance. The Bank will have an initial subscribed capital of US$ 50 billion from the BRICS countries,” said a statement from the South African Presidency. The individual commitments of the five nations to the BRICS CRA will be as follows: China – $41 billion; Brazil, India, and Russia – $18 billion each; and South Africa – $5 billion.